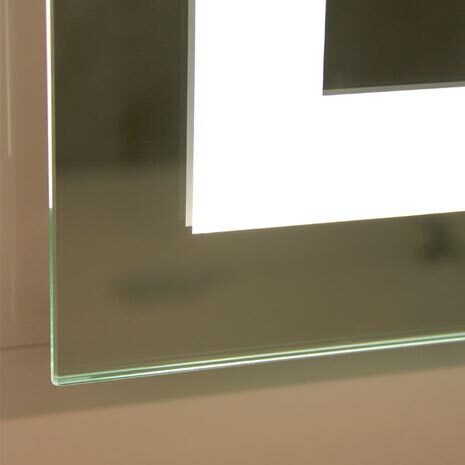 Clearlight Designs uses a new corrosion free mirror by AGC (Asahi Glass Co). It is called New Generation Mirror (MNG) Ecological Mirror, but before we go on let’s talk about what is a mirror? A mirror is a panel of glass with a reflective layer applied to the reverse side of the glass. This reflective covering is protected by a coat of paint. Turn the panel over and look through the glass into the reflective surface. The reflective coating is typically a blend of copper and silver. The copper tarnishes over time which is when you see black corrosion that develops the mirror. 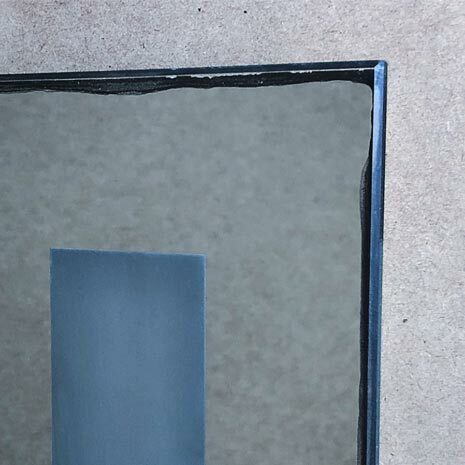 This is found in lower-grade inexpensive mirrors. This is not a problem at first but arises over time. Hence, the life expectancy of a cheap mirror will only be around 12 to 24 months. This is also dependent on a mirror’s setting. In a high humidity setting or coast climate, the life of the mirror could be diminished to months. Clearlight Designs prides itself on using the highest quality mirror available to avoid this problem. We use a new corrosion free mirror called MNG Ecological Mirror by AGC, imported from Belgium. The new corrosion free mirror stands up to these challenges with beautiful reflectivity and uncompromising durability using a patented, copper-free manufacturing process. The new corrosion free mirror is AGC most beautifully reflective and durable mirror, providing unparalleled protection against corrosion, chemicals, moisture and abrasion while adding sophistication, style and elegance to any room. 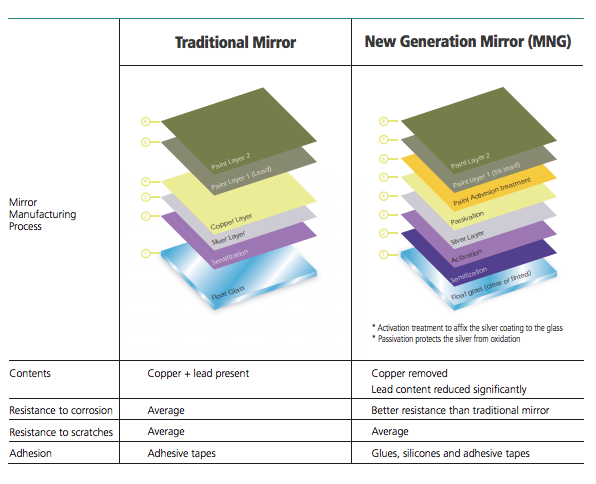 New Generation Mirror (MNG), a copper-free and corrosion resistant mirror, is part of the family of ecological mirrors developed and patented by AGC Glass Europe. All MNG Ecological Mirror info including the image above is the property of AGC Glass Europe. Take trust in knowing that Clearlight Designs is looking after you.